A sound termite solution shouldn’t leave you in the dust when it comes to supporting your business. When you choose Altriset® termiticide from Syngenta, you get more than just effective, long-lasting control against termites: you get trusted research, complimentary customer materials and more. Performance assessments are based upon results or analysis of public information, field observations and/or internal Syngenta evaluations. Trials reflect treatment rates commonly recommended in the marketplace.. Selecting a termiticide should be a decision you make with full confidence in its performance. 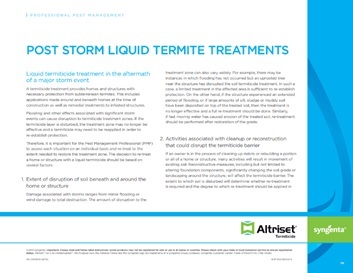 Our technical bulletin provides an in-depth look at the research that went into making Altriset the successful, proven termiticide it is today. Inside, you’ll find an explanation of its unique chemistry, a variety of university trial results and essential product information. Homeowners may not realize it, but having a PMP provide termite control with Altriset is a smart way to protect their biggest investments – their homes. 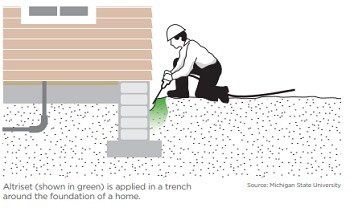 Written with homeowners in mind, this brochure can be given to your customers to help provide basic termite information and details about how Altriset works. It also explains how the product has a low impact on beneficial organisms that homeowners want in their yards, like earthworms. ​​​​​​​Hurricanes, flooding and other storm events can disrupt termiticide zones and even render treatments ineffective. 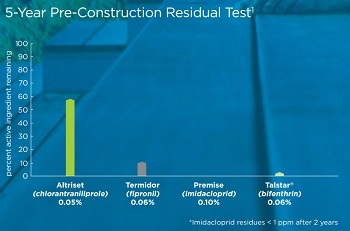 If a termiticide layer is disturbed, Altriset may need to be reapplied to keep the structure protected from termites. This helpful document outlines what you should consider when deciding whether to retreat a home after a major weather incident, including such factors as soil disruption and reconstruction efforts. ​​​​​​​Gain the upper hand in your termite battles — and discover an arsenal of Syngenta support — with Altriset. For more information and free resources, visit www.SyngentaPMP.com/Altriset. ©2019 Syngenta. Important: Always read and follow label instructions. Some products may not be registered for sale or use in all states or counties and/or may have state-specific use requirements. Please check with your local extension service to ensure registration and proper use. Altriset®, For Life Uninterrupted™ and the Syngenta logo are trademarks of a Syngenta Group Company. All other trademarks are property of their respective owners. Syngenta Customer Center: 1-866-SYNGENT(A)(796-4368).